Brian has done some no-nonsense calculations showing that even with a black voter turnout as low as 18%, Obama would have won South Carolina. Here you go. Red is Diebold. I have incorporated Brian's work in my latest analysis. I tried different linear and generalized linear models combining Clinton's score, the total number of votes, the usual demographic data, employment rates, education and latitude and longitude. I took the latest available data sets, got the list of towns using electronic voting from the official site, completed and corrected town names by hand. Anyway the new data is available here, feel free to check, improve and re-publish it. Note that you need the maptools R package. You can install it by typing install.packages(c("maptools", "maps"),dependencies=T)) in R.
Reddit user brfox has started his blog on election statistics and did some analysis taking the geographic distribution of states into account. It seems that there is still a Diebold effect. Meanwhile a column at Salon.com argues geography is the explanation. We need to double- and triple-check check all this data carefully. If, after controlling for various parameters, we still have what looks like a statistical anomaly, we must get some expert opinion. After brfox's message, I have been scavenging the net for a database that would allow me to map New Hampshire voting precincts. I found some data at the USGS, however voting precincts do not match ZIP codes exactly. Also I need latitude/longitude data. 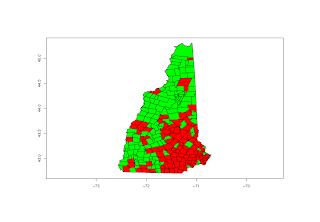 So I parsed the latlong data from Wikipedia, which lists 223 towns. Here it is, feel free to use it or to complete it. We can do a paired study on adjacent voting precints with different methods, or do a regression analysis with latitude/longitude as extra data. Someone from Reddit has just forwarded me a map showing that precincts using Diebold machines are geographically aggregated in the south-east of the state. Finally, this could be the explanation! We still need to do a study of geographically and demographically similar pairs with distinct voting methods.